When it comes to the urge to hibernate and be lazy come cold weather, I’m definitely guilty. The dark evenings make it difficult to make myself head out for a run — more on that here — and I’m hard-pressed to force myself to do 30 minutes on the treadmill. The problem: Winter is a long season in the northeast, and the holidays make it less than ideal to go four months in a sedentary state. Scary stats about weight gain aside, winter is otherwise a good time to slow down, recharge, rest and nourish our bodies mindfully. The trouble comes when you forget to incorporate movement here and there. It doesn’t have to be as much as you do the rest of the year — unless you really want to be able to go for that second helping of cheesy pumpkin pasta — but we don’t feel our best when we don’t give our bodies a chance to sweat and our muscles a chance to work. 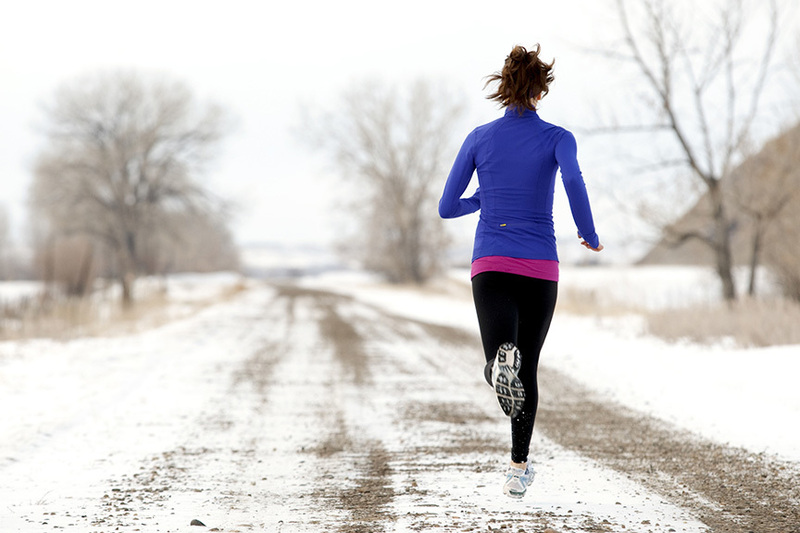 That’s why I asked pro trainers for their best strategies for staying fit through the coldest time of year — here are their top nine tricks. If, like me, 5 p.m. sunsets and cold temps do not make you excited to work out, set your alarm a little earlier in the morning and, as they say, get ‘er done. Not only does some research show that you might have a more efficient workout, but celebrity trainer and master Flywheel instructor Holly Rilinger says it can set your day on the right track. “Start your morning by throwing on your earbuds to get up and move! Music is a proven mood booster so the good vibes will set you up for a good day.” Even better, knowing your gym time is over. Not in the mood or feeling too low-energy for a major cardio session? Head to a yoga class or just do some simple stretches in your living room says Ben Wegman, instructor at New York-based High Intensity Training boutique fitness studio Fhitting Room. “I find that making a point to stretch more during the winter makes huge strides in my well-being,” he says. “Our bodies are naturally tighter and colder in the winter due to the weather, so stretching can improve your mood, clarity, and release some of that tension from compacting your body to hurry through the cold.” Good point. 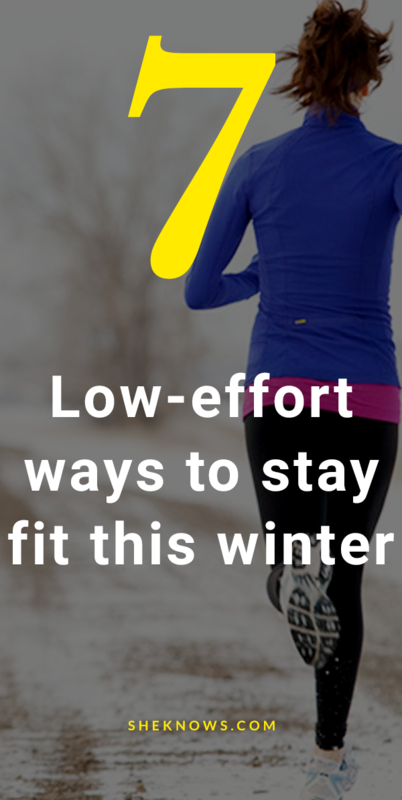 You’ve heard it before, but winter’s a great time for a reminder — simply taking the long or slightly harder way can give you a little more movement and help you burn a few extra calories each day. “Take the stairs,” suggests Derek DeGrazio, celebrity trainer and managing partner at Barry’s Bootcamp Miami. “Lunge around your house instead of walking, or make a habit of doing a set of 10 quick push-ups right after you wake up.” Equally important is self-care during winter, he says. “Identify what you love about the warmer months and find comparable experiences. If you love the heat of the sun on your body, why not find more time for hot, soothing baths in the winter.” Your body will thank you. Even an intentionally lazy activity can become healthier with a little effort, says DeGrazio. Next time you’re binging on Scandal or Gilmore Girls, do planks during commercials. “You can also wall-sit and V-sit while watching a movie or show,” he says. Hey, if it’s an excuse to stay inside and keep Netflix on, I’m in.